Most of these magical incantations are, of course, from the pen of modern day writers like J K Rowling (Harry Potter series), the BBC’s Merlin team of writers or Shakespeare’s witches in M…beth (as in mmmmm….bloodbath, just in case any superstitious actors are reading this blog (as if!)). Merlin’s TV spells are always in either Anglo Saxon or ancient gobbledegook, so we don’t actually know what is being used in his mentor Gaius’ concoctions. So what about “real” magical incantations? Among the very few that have survived the ravages of time and fires of the inquisition there are two dating back to the Middle Ages, which are known as the Merseburg Charms or Merseburger Zaubersprüche. They are in Old High German and are kept in Merseburg, a town on the river Saale, located some 14 km south of Halle in the German state of Saxony-Anhalt. 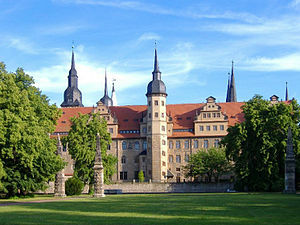 The town was first mentioned in 850 and has many splendid ancient monuments as well as the University of Merseburg, which is a technical university of applied sciences. These two incantations are the only known examples of ancient Germanic pagan beliefs that have been preserved in Old High German. 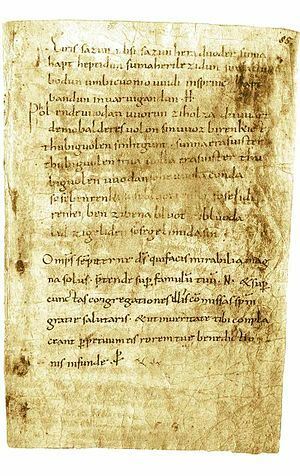 They may not actually belong to the heritage of Merseburg, but they were discovered in a theological manuscript from the town of Fulda, which had been written in the 9th or 10th century and this ancient document had been stored in the library of the cathedral chapter of the lovely town of Merseburg. The Bishopric of Merseburg was once an episcopal see located on the eastern borderline of the Duchy of Saxony in medieval times. Merseburg was situated almost exactly in its heart and here the pious inhabitants of the town built their Merseburg Cathedral between 1009 and 1018 to the glory of a no longer pagan, but Christian god. The Merseburg incantations would have probably continued to languish forgotten in some library or on the desk of some dusty old scholar, but the Brothers Grimm discovered them during their travels and they published them in 1842 to the general amazement of the public. Each of these charms is divided into two parts and they are generally believed to be the foreword to a much large piece of work that tells the story of a major (mythological) event. The first incantation is known as the Lösesegen in German (blessing of delivery (from evil)). The verses chart the release of a group of warriors imprisoned after battle. Magical beings called the Idisen free the warriors from their shackles – and this brings me straight to Willow the Vampire and Valkyries, who rode out on the battle fields and took fallen heroes to Valhalla, where they lived out all eternity in splendour and honour. The second incantation is about Wodan (Wotan) and Baldur, two Norse gods, who ride through the woods, when Baldur’s horse goes lame thanks to a dislocated foot. “Bone to bone, blood to blood, limb to limb, as if they were glued” goes the incantation, which Sinthgut, Sunna’s sister and Frija (Freya or Frigga) employ to heal the horse’s leg. Similar charms or incantations to heal horses have been discovered in Norwegian folklore. This particular charm is perhaps more in line with the type of magical spell or incantation we are used to from William Shakespeare and modern writers. Roughly at the same time as the document of Fulda was written, the Nine Herbs Charm was recorded in a manuscript in England. The incantation is meant to heal someone from the effects of poison and infection. As the numbers nine and three are present throughout the verses, they are obviously a reference to Germanic paganism, where these two numbers are of great significance. The application of nine herbs and the way in which the incantation is written suggest that the verses were initially written by an English pagan person, but a later Christian influence is also present. Woden (Wotan) is also mentioned in the incantation, making it clearly a Germanic folklore item. The herbs mugwort, cockspur grass, lamb’s cress, plantain, matricaria, nettle, crab-apple, thyme and fennel are mixed with apple juice and soap of all things to make an ointment, which is then placed in the mouth, over the ears and the wound of the ill person. While this no doubt fragrant stuff is applied, the healer sings the incantation three times. Willow the Vampire loves animals and would never wish them harm. Using ground frog, wing of butterfly or fur of black cat would appal her. However, there’s one villain of the animal world, which Willow might not be too upset about grinding up to a pulp: the cane toad. This pesky amphibian will be the subject of my next blog. 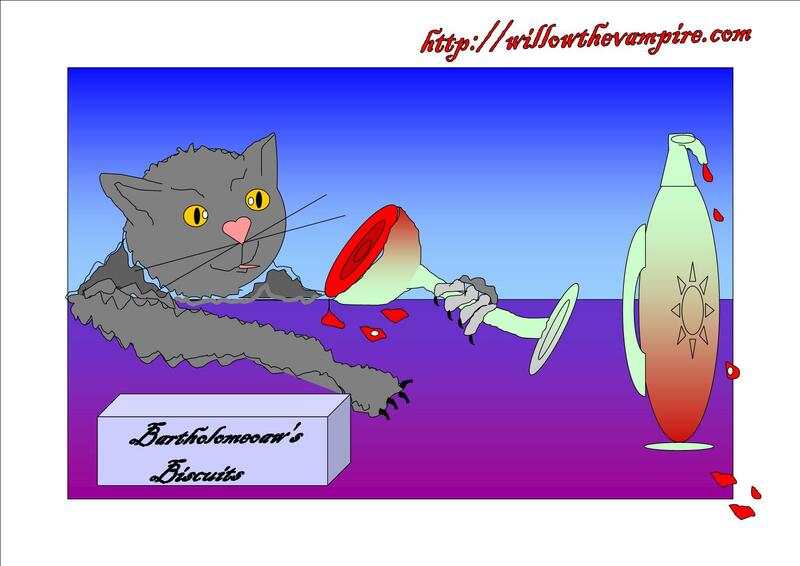 Until then, I’ll be enjoying a cup of bloodwine with Bartholomeaow and Willow the Vampire. I wish I had a crystal ball which could see back to the time when those books were being written in Germany. Oh, if only. I have always loved the scene in Macbeth, and of course I enjoyed Harry Potter as well. I love Merlin’s spells, it is just so easy to lose yourself when seeing or watching these spells. It is amazing, but of course fantastic that some of these old books have survived. I know, with all the inquisition and witchhunting business throughout the ages, it’s amazing that anything has survived at all. I’m a big fan of the BBC’s Merlin series, as if you hadn’t guessed already, hehe, so seeing knights in a real jousting tournament or finding out about “real” magic spells is just wonderful. Macbeth and The Tempest are my two favourite plays by WS, so glad you like Mmmmm-beth’s witchy-woo scene, too.